During July and September 2003, trial and salvage excavations were conducted at the el-Jura site on Ben-Gurion Boulevard in Ashqelon (Permit No. A-3959; map ref. 15825–35/61928–35; Fig. 1), prior to the construction of a public library. 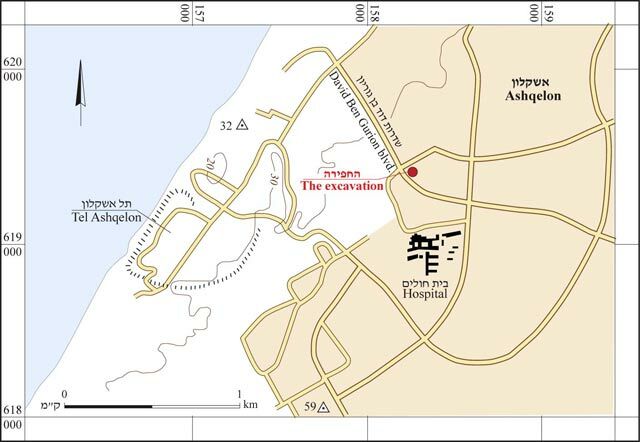 The excavations, undertaken on behalf of the Israel Authority Antiquities and underwritten by the Ashqelon municipality, were directed by E. Kogan-Zehavi, with the assistance of H. Lavi (administration), A. Hajian (surveying), T. Sagiv (field photography), Y. Nagar (physical anthropology), E. Belashov (drafting), O. Shorr (restoration), I. Lidski-Reznikov (pottery drawing) and C. Amit (studio photography). The site, located c. 2 km east of Tel Ashqelon, had been excavated in the past. Excavations south of the site revealed a cemetery from the Roman and Byzantine periods, which included pit graves with wooden and lead coffins, cist graves from the Roman period and a Byzantine burial structure with an arched roof (ESI 20:120*–121*). 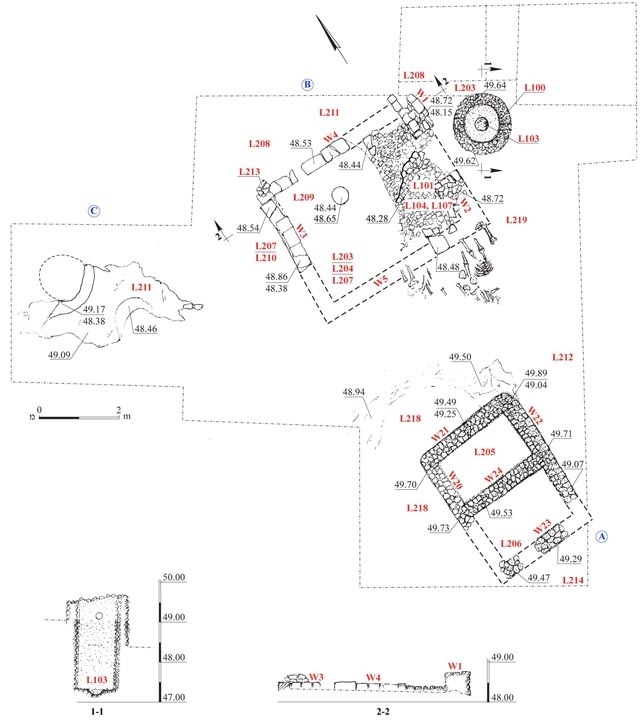 Remains that dated to the Byzantine period, and included installations, burial structures and a refuse pit were exposed in several excavations to the east of the site (ESI 18:113; HA-ESI 110:70*–71*, 97*; 113:125*–126*). A well was exposed in an excavation conducted by the author, c. 200 m east of the current site, and other remains indicated the presence of a temporary settlement, ascribed to the Early Bronze Age (HA-ESI 118). A built tomb dating the Roman period and a round plastered installation were exposed in an excavation within the precincts of the Barzilay hospital, south of the current site (HA-ESI 119). Three squares (A–C) were opened in and beneath a sand dune, to a depth of c. 1.5 m below the surface. The exposed antiquities included a round installation that was probably a well, which did not predate the Byzantine period, a built installation from the Byzantine period, part of a burial structure from the Roman period and a bowl from the Iron Age (Fig. 2). A round installation, built of small fieldstones bonded with cement, was exposed in the eastern part of Sq B; the upper part was destroyed (L100; outer diam. 1.5 m, max. depth 2.4 m; Fig. 3). The interior of the installation was coated with gray hydraulic plaster. A round sump (depth 0.1 m) was installed at the bottom of the installation and a round hole was fixed in its eastern side (diam. 8 cm; see Fig. 2: Section 1-1). Based on its construction and the hydraulic plaster applied to its interior, the installation was identified as a cistern. A scant amount of potsherds was discovered at the bottom of the cistern (L103), including but a single diagnostic fragment of a jar rim dating to the Byzantine period (Fig. 4:3). It is difficult to date the cistern due to the paucity of finds and because it is an open installation. It was determined that the cistern was built after the Roman period because the construction of its bottom damaged remains from this period (below). It was presumably built in the Byzantine period, since no later remains were found at the site. A built installation (3.0 × 3.9 m; Fig. 5) was partially exposed c. 4 m south of the cistern; oriented north–south, it consisted of two rectangular compartments of identical size (L205, L206). The walls of the installation (thickness 0.3 m), built of fieldstones and bonded with cement, were coated on both sides with gray plaster. The top of a wall (W24) that separated the two compartments was plastered; therefore, it can be assumed that the compartments’ walls were lower (max. height 0.7 m). The interior of the installation was not excavated, due to the suspicion that it was a tomb. The few artifacts recovered from the installation included ribbed potsherds and a rim of a Late Roman C bowl (Fig. 4:1) found in the fill that covered the northern compartment (L205) and a krater rim from the fill outside the installation (L218; Fig. 4:2). A special find recovered from the fill east of the installation (L208) was a fragment of a bone implement decorated with the incised image of a woman (Fig. 4:4). The installation was dated to the Byzantine period on account of the ceramic finds and the gray plaster that covered the walls of the compartments, which was similar to the plaster in the cistern. 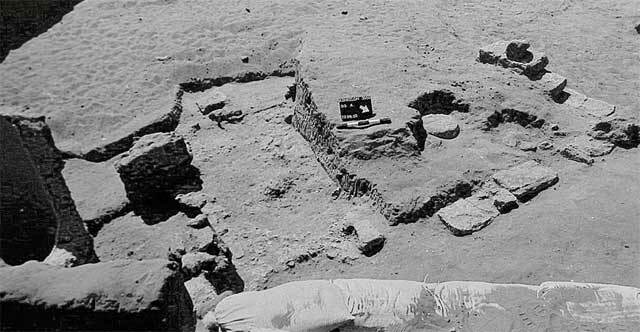 The partial exposure of the structure and the meager finds were not helpful in determining the use of the structure. This was probably a built tomb, whose remaining two compartments remained had been used as burial troughs, or the plastered compartments were part of an installation that was associated with the nearby cistern. 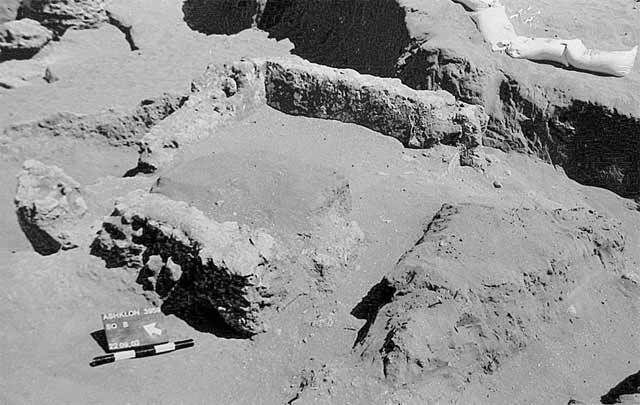 The poorly preserved remains of a burial structure (inner dimensions 2.6 × 3.3 m), oriented east–west, were exposed in Sq B. Sections of its walls, built of carelessly dressed kurkar stones (W1–W5), were exposed, as well as a floor (L104, L107) of small fieldstones, in which a round ceramic tile was incorporated. The southern side and southwestern corner of the tomb did not survive and its eastern side was damaged by the cistern’s construction (see Fig. 3). Poorly preserved human bones, whose measurements could not be reconstructed, were discovered on the floor of the tomb and to its south. The bones represented five individuals, aged 10, <3, >15, and >40 years of age, as well as teeth of another individual whose age is unknown. The individuals were interred in primary burial, oriented north–south. Some of the bones were discovered outside the burial structure, beyond W5 that delimited the tomb on the south. Yet, W5 may have served as a partition wall and beyond it to the south was another burial chamber that did not survive; the bones may have also been removed from their original location. The bones were examined in the excavation area and left in place. Fragments of various pottery vessels that dated the use of the structure to the Roman period were discovered inside the tomb. The most rewarding finds on the floor of the tomb included fragments of imported jars and amphorae from North Africa (Fig. 4:7–12). The amphorae in Fig. 4:7, 8 are TripolitanianType III amphorae and one of them is stamped with a seal impression, composed of three Latin letters: PLS (Fig. 4:7). This type first appeared in the second century CE and was common until the fourth century CE (See Type 37 in Peacock D.P.S. & William D.F. 1986. Amphorae and the Roman Economy, An Introductory Guide. New York, p. 169). The jar in Fig. 4:9 is a Tunisian-type vessel that was mainly used in the fourth century CE, although it first appeared earlier (Peacock and William 1986: Type 35, Sub-type XLVI, p. 162). The jar in Fig. 4:10 is classified as a ‘Grande’ or Africana IIB type, dating from the end of the second to the fourth centuries CE (Peacock and William 1986: Type 34, Sub-type B, p. 155). In addition, a bowl’s rim (Fig. 4:5), a cooking pot (Fig. 4:6), a discus lamp (Fig. 4:13), and a stone lid fragment of a coffin (Fig. 6), were found. Potsherds from the Roman period were also discovered around the tomb; they were probably scattered when the structure was destroyed and included a bowl (Fig. 4:14) and a jar (Fig. 4:15). A special find consisted of a stone mold for making clay lamps (Fig. 4:16). The high kurkar bedrock, in which two shallow elliptical depressions were carved, was exposed west of the tomb. 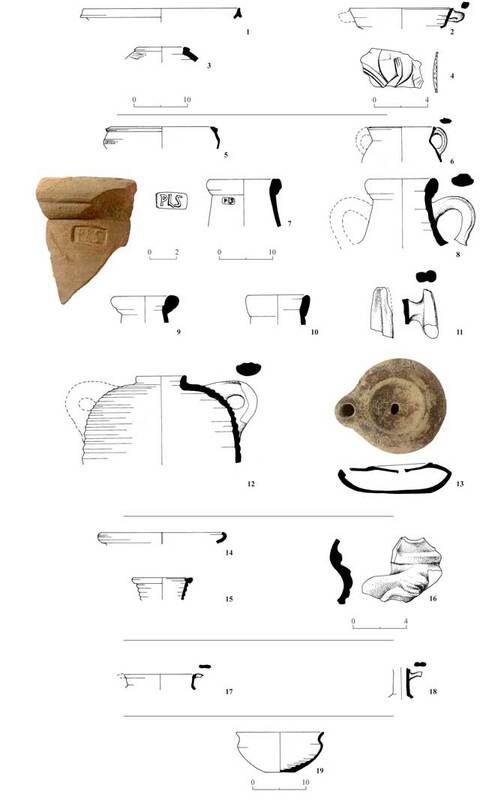 The fill accumulating in the depressions (L211) contained a cooking pot rim (Fig. 4:17) and a neck of a terra sigillata jug (Fig. 4:18), dating to the Early Roman period and indicating that there may have been a presence at the site during this period as well. bedrock, in which two shallow elliptical depressions were carved, was exposed west of the tomb. A layer of hard hamra soil, overlying kurkar bedrock, was exposed below the level of the Roman tomb, in a probe trench dug to the west of the tomb (L210). A carinated bowl dating to Iron Age II (Fig. 4:19) was discovered in the hamra soil. Since the probe was limited and no building remains were discovered, it was impossible to assess the size and contents of the Iron Age presence at the site. The excavation finds are consistent with what is known from previous excavations, which suggest that in the Roman and Byzantine periods, the areas around the ancient city were utilized for burial and for installations that were employed in a variety of activities. The Iron Age II bowl is a novelty, since the only Iron Age settlement that has been discovered until now is within the boundaries of Tel Ashqelon and the bowl fragment may indicate that the exploitation of areas outside the city had already begun in this period. 3. The burial structure and circular installation, looking southwest. 4. Pottery and a bone find. 5. An installation with two compartments, looking northeast. 6. Fragment of a coffin lid.